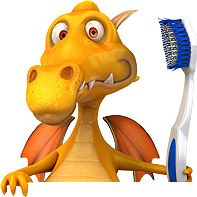 In the relaxed and child-friendly atmosphere of our pedodontic practice , children will be introduced to a visit to the dentist as a positive experience for the treatment of baby teeth or later the permanent teeth. We guarantee that, besides the optimized dental treatment and care, your child will feel very comfortable with our female dentist in Munich. Aside from the compassionate and caring treatment, we want the visit to the dentist to continue to be a positive experience, so that fear of the dentist doesn’t even occur or can be reduced if present. Preventing dental disease through prophylactic measures is part of our complete care program. The entire team, practice concept and atmosphere of the dental practice in Munich Bogenhausen are all geared to give your child the best care possible. Um sich und Ihre Kinder auf den Besuch bei uns vorzubereiten, haben wir Ihnen einige Informationen zu unser Praxis, den Behandlungs- und Prophylaxemöglichkeiten auf den folgenden Seiten zusammengestellt.